Benjamin “Ben” Thompson, aka: Shotgun Ben (1843-1884) – Born in Knottingly, Yorkshire, England on November, 2 1843, the Thompson family immigrated to the United States in 1851. Settling in Austin, Texas, Thompson became a printer working for various Austin newspapers. At the age of 15, he wounded his first man, in an argument about his shooting abilities. By 1859, Thompson had moved to New Orleans where he worked for a bookbinder and killed his first man when he saw him abusing a woman. When the Civil War began, he returned to Texas, enlisting with the 2nd Texas Cavalry. After fatally shooting a teamster in an argument in May, 1865, he fled to Mexico. Returning to Texas, he wounded his brother-in-law who was abusing his pregnant sister and spent two years in the Texas State Penitentiary. Afterwards, he headed to Abilene, Kansas, hoping to change his fortunes. For the next several years he moved about Kansas and Colorado, primarily as a professional gambler and involved in several shootouts. 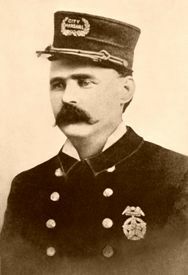 Later he returned to Austin once again where he became the city marshal in December, 1880. In 1882, while still serving as an Austin marshal, Thompson quarreled over a card game in San Antonio, where he killed the owner of the Vaudeville Theatre, Jack Harris, allegedly his 21st victim. Though he was acquitted of murder, he was assassinated on March 11, 1884, in the Vaudeville Theatre, in revenge for the killing of Jack Harris.